Guest Post By Adam Rapoport, editor-in-chief, Bon Appetit, father of Marlon, age 3. It took hiring a babysitter for me to finally recognize the obvious—that boneless, skinless chicken breasts don’t offer much in the way of flavor. About a year ago, our sitter, Gina, started frying up chicken cutlets made from boneless thighs for our chunky, high-octane son Marlon. I’d get home from work, open the fridge, peel away the aluminum foil and take a nibble, and then another nibble, and then basically do all I could not to devour the entire plate. They were assertively seasoned, rich with flavor and perfectly crispy. If I were still in college, I reckon I could survive on them for an entire semester. Of course, now that I’m all grown-up and a dad and whatnot, I’ve got to strive for something a bit more sophisticated. Which is where the Milanese comes in. 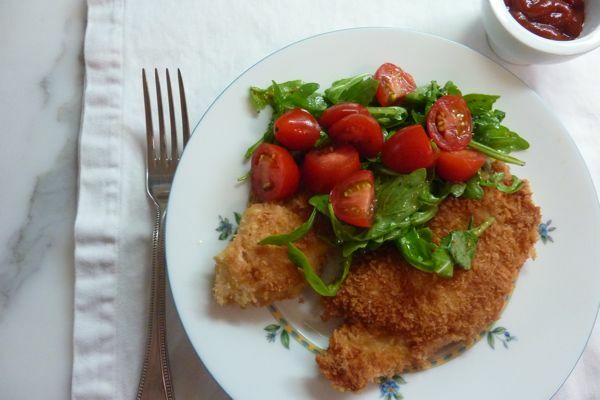 I’ve always loved Veal Milanese, the pounded-thin, bone-in fried cutlet topped with a tangle of baby arugula and a mess of cherry tomatoes. But the fact is, using chicken thighs instead of veal actually packs more punch. My wife Simone and I make Chicken Milanese throughout the year (although there’s something particularly appealing about it in the summer, especially when you pair it with a well-chilled bottle of rosé). Besides chicken thighs, are other go-to ingredient is panko, the Japanese breadcrumbs you can now get pretty much anywhere. They’re like tiny little shards that fry up extra crisp and brittle. And, of course, we always make extra cutlets so Marlon can get his share too. Although, for now at least, he’s saying no to the arugula and tomato and yes to ketchup. A couple of things to keep in mind: First, season every step of the way with salt and pepper; you want the chicken to be flavorful throughout. Second, cutlets are easier to fry the thinner they are. So, if you want, pounding out the chicken pieces (or asking your butcher to do so) is a good idea. 1. Sprinkle 1 to 2 pounds boneless skinless chicken thighs with salt and pepper. 2. Meanwhile, set out three large plates or cereal bowls. Fill the first with flour, the second with two beaten eggs and the third with a pile of panko. Season each with a little salt and pepper. 3. Using one hand (so the other remains clean), dip a piece of chicken in the flour and shake off excess. Then dip it in the egg wash and shake off excess. Finally, plop it into the pile of panko and thoroughly coat it. Place it on a plate or sheet tray. Repeat until all the chicken is breaded. Replenish the flour, eggs or panko as necessary. 4. Place a couple of large frying pans filled with a generous amount of olive oil (you’re not exactly deep frying, but pretty close) over medium high heat. When hot, lay the cutlets in. When golden brown, flip and continue cooking. Depending on the thickness of the chicken, this should only take a few minutes. Just make sure the heat isn’t too high, or the panko will get overly browned. 5. When nice and golden and beautiful, remove to a wire racks set on a sheet tray. 6. In a big bowl, combine baby arugula and tomatoes (in the off-season, use cherry tomatoes; this time of year, though, big, fat, ripe greenmarket tomatoes are obviously great). Dress with extra-virgin olive oil, a little lemon juice and salt. 7. Plate the cutlets, top with the salad, set out some lemon wedges and open the rosé. And don’t forget the ketchup. Perfect idea – I’m definitely making this next week. Everyone in our house (who chews) will like it. Love cooking with panko too. Where would you get Panko (aside from the internet)? I live in NYC. I live in NYC too and I have found Panko at my neighborhood grocery store, but the stores vary from area to area. Whole Foods definitely has them. I made these on Friday for my husband and a dinner guest. They were a hit. I plated on top of an orzo risotto because I love carbs with my chicken. 🙂 Delicious. I’m going to make again and again. Amazing how much flavor. And the chicken paired beautifully with the peppery arugla and fresh heirloom tomatoes that are to die for these days. I enjoy your simple recipes and how you value the family dinner time. I love finding more uses for Panko as well. Thanks!